Our library print and e-book collections serve student patrons aged 10-22. Since we have mature content on the library shelves and among the e-books, we encourage parents to be actively involved in their child’s selection of age-appropriate resources. These library web pages as well as the “Resource Lists” in our Library Catalog offer award-winning and highly regarded book recommendations. Just click the library catalog open, and click on “Resource Lists” as the image below suggests. 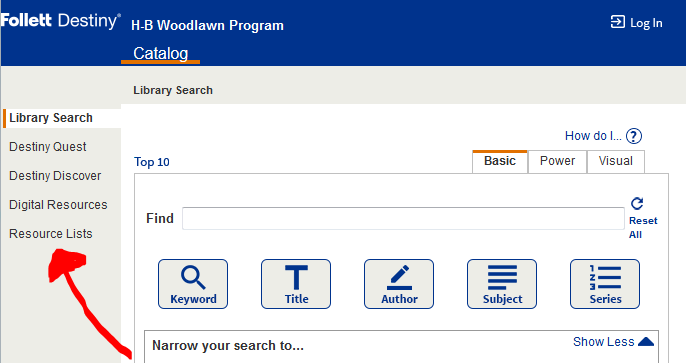 Also, by using the “Power” searching tab of our library catalog you can zero in on the interest/maturity level or reading level of works in our collection. Over the years, H-B’s former librarian Theresa Flynn (who continues her dedicated service to our community as APS’s Supervisor of Libraries) compiled invaluable advice on a variety of topics of interest to parents. The content is just so good, so it is archived below even though some links might be out of date and we have added great resources to our collection since those articles were written. Click on the links below to view each article. Where to start with this genre? Check it out. Sci-fi’s little sister. Or big troll. Your choice.